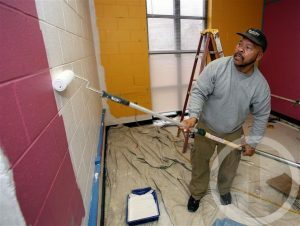 WorldLegacy’s NC167 leadership team created an extreme makeover at the Boys and Girls Club in Rocky Mount, NC. NC167’s vision was to provide a space for children to reach their full potential. The space will ensure success is within reach of every young adult who enters the doors at the Boys and Girls Club. NC167 was committed to having youth discover and achieve their dreams while growing into healthy productive citizens. This project created a state of the art computer lab at the Lucy Ann Boddie Brew Unit. In less than three days the team provided the Boys and Girls Club: 16 HP computers, technology desks, 16 Computer ergonomic chairs, a wireless router and wireless printers. In addition, the art room floor was painted and the computer floor cleaned, buffed and waxed. The exterior of the building got a face-lift including new signage, a painted entrance and pressure washing. In addition, the team created eight custom made wood tables, one 65-inch smart television, 12 plants, a full supply of art materials, educational toys, and inspirational art canvasses for the wall. desktop computers, eight fold-up tables, software and networking. The renovated project was completed in three days on Friday, Saturday and Sunday. 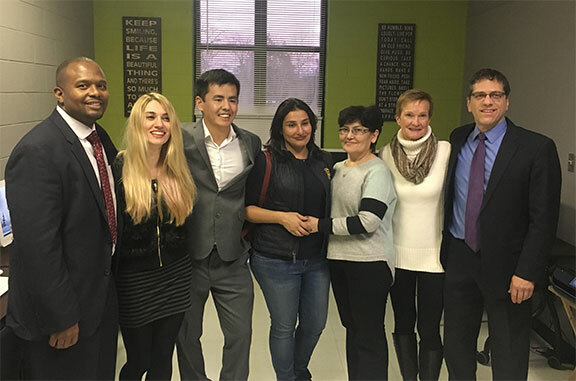 The project was culminated with a ribbon cutting ceremony and celebration on Sunday. The makeover of the computer lab was made possible by WorldLegacy’s NC 167 Leadership Team. WorldLegacy is a company with a vision of making a positive difference in the world. Minnesota native Cindy Kunz, who came down to Rocky Mount to help with the revamped computer lab project, is a member of WorldLegacy’s NC 167. She said it’s a three-month leadership development program, whose purpose is people transforming the world. Kunz said Raheen Norman, who resides in Rocky Mount and also is a member of WordLegacy’s NC167, was behind the idea to put in a computer lab in the Boys & Girls Club. Kunz said program members had to submit a project proposal and the group came to an agreement or voted to do the computer lab for the club. “We know children are the future, so we’re laying a foundation now for kids to learn to grow to hopefully make their own vision for the world,” Kunz said. Kunz said the nine members of NC167 were charged with designing the project from start to finish and couldn’t use any of their own money to finance the project. Kunz said the members could only do 25 percent of the work and had to enroll the community to do the other 75 percent. Norman said 16 people from across Eastern North Carolina donated computers from Office Depot. Tarrick Pittman, owner and operator of CoolGeeks in downtown Rocky Mount, came by to do all the computer set up and networking. In addition to the new computers, the room in the lab was painted, while the floor was cleaned and buffed. The exterior of the Boys & Girls Club received a face-lift, including a power washing, a painted entrance and new signage. Ron Green, CEO of the Boys & Girls Club of the Tar River Region, said he appreciates WorldLegacy for choosing the Boys & Girls Clubs from among the other different projects that could’ve been done in other areas. Green acknowledged in many cases the children that come to the Boys & Girls Clubs only have access to a computer or Internet at school. With many classes today having children do homework online, it can cause them to fall behind. The new computer lab will provide the children with the same access they get at school with the new computers and Internet speed. “One of the goals I had since I came here was to upgrade or redo the computer lab, and that goal has been accomplished,” Green said. “This also gives us an opportunity to bridge the digital divide because the way technology is today, many of our young people we serve are behind because they don’t have access to the Internet or a computer when they’re home. It make us feel good that we can provide it for them.” Norman said it’s good for the club members to know that there are people that want to assist in helping the Boys & Girls Clubs. Boys & Girls Clubs of the Tar River Region.